Description: BNSF 8020 and NREX 6411 lead a westbound manifest around the curve in Arvilla. Description: A very nice telephoto shot of an all SD40-2 consist that is waiting to get rolling. I really like the perspective of this shot. Description: Four BNSF SD40-2s lead a mixed freight west. I think this must be somewhat rare seeing four SD40-2s on a BNSF train nowadays. Description: Not too bad, 4 SD40-2s sit as the conductor goes and grabs some Subway. Description: A single ex-BN SD40-2 takes a loaded rock train down the Cherokee Sub. towards a worksite. 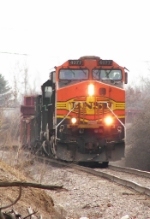 You'll notice that the locomotive retains its original BN Logo, with a small BNSF patch over the lettering below that. Description: Approaching Weber Road using lots of sand was BNSF Train H MEMGAL9 15 with an ex-BN trailing. Description: BNSF (ex-BN) SD40-2 8020 at Cherokee Yard. Description: Hump engines at Cherokee Yard. Taken before getting to work. Description: Nice to see older power on the lead for once and all 4 new GEs dead in tow. Description: Note the old BN logo still showing in 2011! Description: Local 14 makes it into town and picks up the 2 SD40-2s. Title: BNSF 8020 rolls west out of dodge city. Description: Great to see this semi unpatched BN SD40-2 with its old RS3K horn for the local. Description: 2 SD40-2s in charge of local 13.